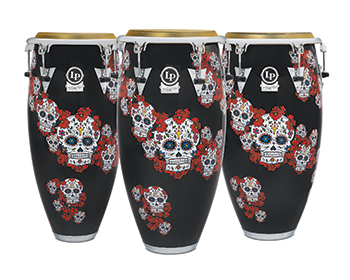 (11th January, 2019 – Oxnard, CA) Latin Percussion has announced the introduction of new Karl Perazzo Signature Congas and matching Bongos featuring Dia de los Muertos skull artwork designed by Perazzo to match his most recent live set-up with Santana. The graphic that adorns the badge of the San Francisco native’s existing signature timbales (LP1415-KP), and now his matching congas and bongos, is said to pay tribute to past generations of loved ones as part of the Mexican holiday, Dia de los Muertos or Day of the Dead. The signature collection also offers matching LP Karl Perazzo Signature Bongos (LP794X-KP). The set includes 7-1/4" and 8-5/8” bongos as well as an 11” Signature Mini Conga (LPM198-KP) complete with Chrome plated hardware and a fully tuneable head.